". . . walk cheerfully over the world, answering that of God in everyone." 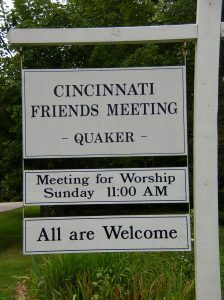 Cincinnati Friends Meeting is a semi-programmed Quaker meeting—that means we have a pastor who gives a brief message at the beginning of the service. The rest of our hour together is spent in silent, open worship as we listen to what the still, small voice of God might say to us. Sometimes others might speak out of the silence, or request a hymn. Through such shared ministry we grow together in Spirit and community. We are an Open and Affirming congregation, and a Solidarity Congregation in relationship with the Sanctuary Movement. By tradition we are Christian, but recognize that our world is interdependent, composed of many cultures and faith traditions. We seek to grow together spiritually, and learn from one another in peace. Respecting our differences, we seek a more compassionate and loving world, helping others as we would like to be helped. 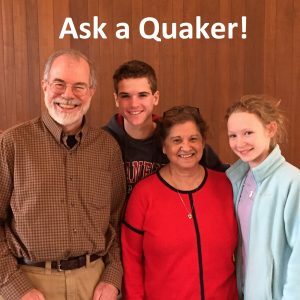 We welcome everyone interested in our way of worship and Quaker testimonies—simplicity, peace, integrity, community, and equality. Refreshments and fellowship follow worship except for the second Sunday of every month, which is when we typically conduct Meeting for Business. If you need access to the office outside of these hours, please contact us.